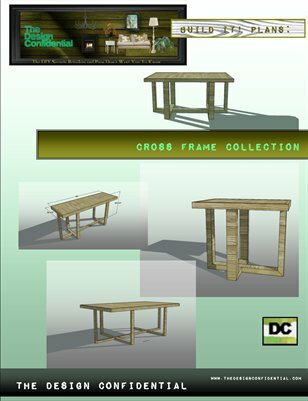 This Issue contains the plans and instructions for building the Console Desk for the Cross Frame Collection. This piece can accommodate more than one use, and might be placed behind a sofa or in an entryway as a console table, and with a chair for use as a workspace or desk. This is especially convenient for small spaces and individuals who prefer multi-function furniture. Instructions are easy to follow, and require no special tools or skills, that anyone on any budget can build!